You are here:Home-Domain.com-What is the Difference Between a Domain Name and a Website URL? What is the Difference Between a Domain Name and a Website URL? Setting up your business online helps you reach a larger audience and expand your brand beyond brick and mortar. When you start laying down the foundation of your online presence, it helps to know the differences between your building materials. This helps you make more informed decisions about what’s right for your brand and helps you talk with experts to get the help you need. Find out the essential differences between domain names, URLs, and websites to start laying down the first steps that brings your idea to life. In the vast world of the internet, a domain name plants a stake in the ground for your business so your target audience can more easily find you. The domain is your address online, and the name that customers type in when they want to find your business. It’s the ‘Domain.com’ in the URL in the address bar at the top of this page. Domain names were created as a stand-in for a website’s Internet Protocol, or IP address, which is simply a unique series of numbers identifying the specific computer server where the website is hosted. It’s much simpler to remember a name than a string of random numbers, and it looks much better on a t-shirt. The address bar at the top of a web page, commonly called a URL, is the universal resource locator. This includes all of the information your computer needs to find the right page, image, or document on a website. Your domain name is included in the URL, but a domain is not the same thing as a URL. Simply put, a URL is the whole string of characters, creating a map that leads your computer where you want to go online. The example above is a URL, a computer would start reading the letters .COM, also called a top-level domain (TLD). Then, it would move left to include the domain name, Domain.com to find the right website. Once it locates the servers where the website is hosted, it checks the characters after the TLD, in this case, the ‘/domains/’ in order to locate the right web page to display. The ‘https://’ stands for Secure Hypertext Transfer Protocol. A protocol is a command that tells your computer to read the following information as hypertext, which is a structured language that uses logical links, called hyperlinks, between different nodes on the web page that contain text. Your domain is your address online and a URL leads people to your front door, but your website is the actual house where your business lives. While the tools for building your website vary, whatever you build needs to be pointed to your domain, so the links between them can connect. Knowing how your domain name, the URL and your website all work together to drive traffic for your business is like knowing the basics of the systems in your house, like how to check a fuse. If anything dire occurs, you can lean on the help of professionals, but knowing the basics helps you explain issues to an expert, or fix minor issues yourself to get back to business more quickly. 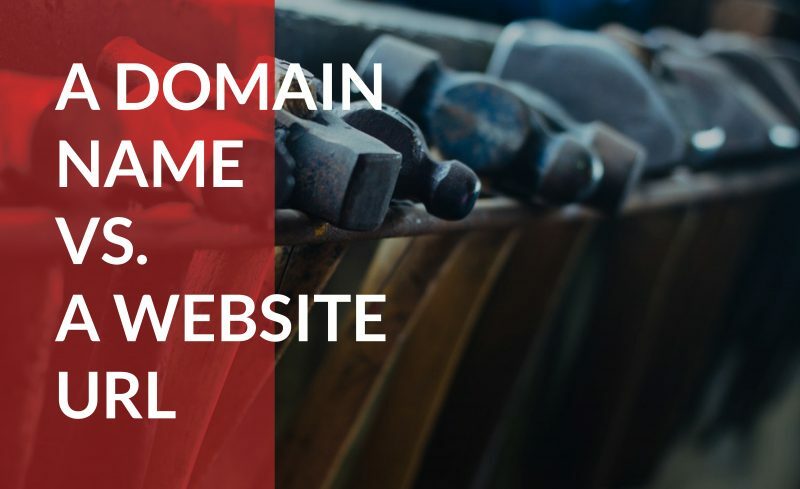 If your website is not properly displaying on your domain, the most likely reason is an improperly mapped to the right Domain Name Server (DNS), which means your domain and website aren’t properly synced and can’t talk to each other. Check to make sure your domain is accurately pointed to your website through both your registrar account and your website provider. If the website is still not showing, customer support should be able to get you back online. Building an audience that sustains your new business idea requires a secure foundation online. Knowing the differences between a domain name, a URL, and a website not only helps you better run your business, but it also gives you more control when deciding what’s right for your brand.